Missing the Kentucky Fried Chicken? If you’re a KFC™ lover, this low carb fried chicken recipe is perfect for you. We’ve tried a few keto fried chicken recipes before but this one is the best so far. It’s soft and moist inside, crunchy outside, a little spicy and very tasty. This recipe is like a Copycat KFC™ chicken with many herbs and spices but low carb. Before chopping the chicken thighs into small chunks, make sure to thoroughly wash and dry them. Grind the garlic cloves and all the spices with a blender or a mortar. Flavor the chicken with this spice mix. Crack in the egg and pour the milk into the seasoned chicken pieces. Stir well to marinate well. Transfer the chicken to a covered container and let it chill in the fridge for around an hour. Flip the chunks occasionally. Pour the protein powder in a plastic container with a lid. Put the chicken in the container before replacing the lid. Shake well to coat the chicken entirely. Set a deep fryer to 375 degrees and heat the oil in the fryer. 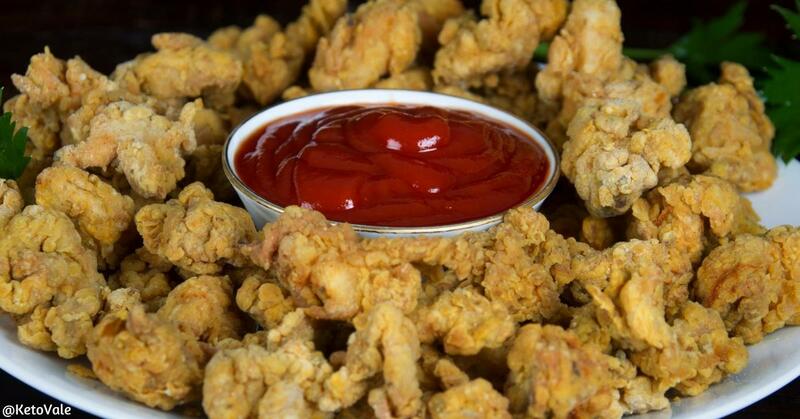 Crispy fry the chicken for 5-7 minutes. Wait till the chunks become golden brown and crispy enough to your liking. Transfer to a platter with any keto-approved dip of your choice. This recipe is enough for 6 people to enjoy. The macros info below is for 6 servings and it doesn't include the oil you use for deep frying. 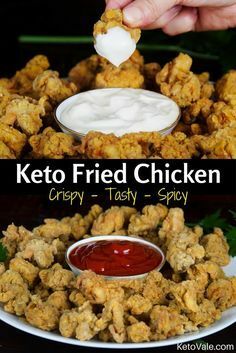 0 Response to "Crispy Keto Fried Chicken"